Let me be real for a minute. Food is freaking expensive. The average cost of groceries for a family of four averages out to about $200 if you follow the four plans the FDA provides as a guide. When I realized I was spending more on groceries every month than my bills, I knew it was time for a change. Here are eight tips and tricks I learned along the way to help you slash your grocery bill without compromising your diet or living on nothing but ramen noodles. How many times have you walked into the grocery store with no idea what you needed and just a vague idea of what you wanted to eat for the rest of the week? Stop shaking your head. I do it, and I know you’ve done it, too. This is a great way to spend a ton of money on food that you don’t need that will spoil in your fridge before you get around to eating it. Instead, take a few minutes to plan your weekly menu. Figure out what foods you want to have on hand for breakfasts and lunches, and choose what dinners you’re going to cook during the week. If you’re going out to dinner one night, include that in your plan. We buy a lot of perishables every time we go to the store. Milk, cheese, meat and bread have a limited shelf life, even when refrigerated, and shopping for the month could leave you scrambling to run to the store because the roast you were planning to make has spoiled in the meantime. Instead, pick a day of the week and shop on that same day, every week. You’ll end up buying less food, thus throwing away less food and saving you money in the long run. 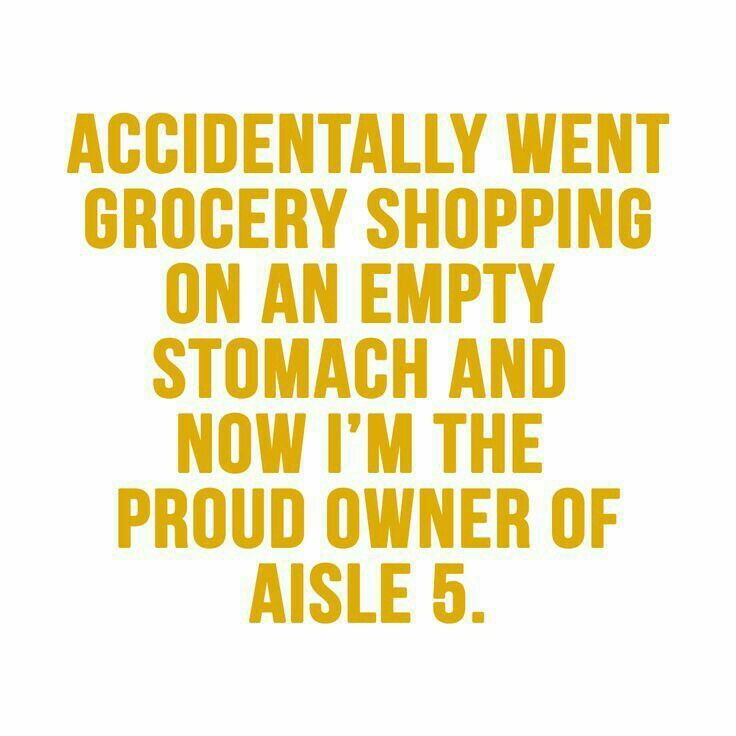 How many times have you been guilty of this rookie grocery shopping mistake? If you go shopping when you’re hungry, you’re going to buy more food. Your stomach overrides your brain, and suddenly everything in the snack aisle NEEDS to be in your cart. Make sure you’ve eaten before you head out to go grocery shopping, so you don’t feel tempted to buy unneeded items. The average grocery bill for a family of four is nearly $300 a week. If I shop when I’m hungry, I can easily double that — whether I’ve got the money for it or not. If you have a Sam’s Club or Costco membership, why aren’t you using it? According to experts, buying dry and paper goods in bulk can save you up to 83 percent on some purchases. You can even purchase some perishables, like meat and produce, in bulk to reduce your costs. Just remember to take the time to prepare and freeze them until you’re ready to eat them. 5. Write a Damn List, Already! Don’t. Go. Grocery. Shopping. Without. A. List! I can’t reinforce that enough. Without a list, you’re working on a mental image of what you think you need at home, and it always ends up being more than necessary. Write a list, and stick to it as closely as you can. I’m not saying to ignore excellent deals when you find them, but if it’s not something you can freeze or use in the coming week, leave it behind. It’s tempting to buy brand-name food all the time because these brands spend so much money on marketing that it’s easy to fall prey to the lie that the product is better. Spoiler alert — it’s not. Even some generic medications are as good or better than their name-brand counterpart, and they cost a fraction of the price. When spring allergies kick me in the teeth every year, I live on a steady diet of Claritin, and I can tell you from experience that the $4 generic pills from Wal-Mart work just as well as the $18 name-brand ones. Most generic products are 15 to 30 percent cheaper than the name-brand, which can save you a ton of money in the long run. It’s nice to have apples or strawberries year-round, but unless you’re setting up a hydroponic garden and growing them yourself, this produce only grows during a limited season during the year. Buying off-season produce costs more because it’s being shipped from distant locales. Check out a list like this to see what’s in season in your part of the country. Right now, it’s spring in Pennsylvania, where I’m currently living, which means foods like apples, grapes, leeks and kale are in season and will cost less. If you’ve got a chance, try to shop at local farmer’s markets for your produce. It’ll be cheaper, because it doesn’t have to travel as far, and you’ll never have to guess what’s in season. If they don’t have it, it’s not in season. Easy peasy! Once a week or so, your local grocery store will probably mark down meats and other perishables that are approaching their sell-by date. This doesn’t mean the food has gone bad — just that the store needs it gone in the next day so they can still make money off of it. I love discounted meats because I can get perfectly good hamburger meat, steak or chicken at a dramatic discount, and as long as I freeze it as soon as I get home, it still lasts for weeks. Now, I won’t buy discounted meat if it looks brown or gross. I do have some standards. But if it seems just as good as the full-price stuff next to it, it’s going into my cart. It might take some time to get used to one or more of these steps, but you can slash your grocery bill dramatically by just being smart about how, when, and where you shop. Try out a few of these tips, and let me know how they work for you!